1. To list an item solely to your eCommerce storefront, get into a product by going to Products > All Products and click on the GUID you want to edit. When you are in the single item editor, start out by unchecking all of the channels you have activated. 2. Next, you need to fill in the required fields in the General section. Title, Price, In Stock Are the required fields. Suggested fields include Condition and Full Description. 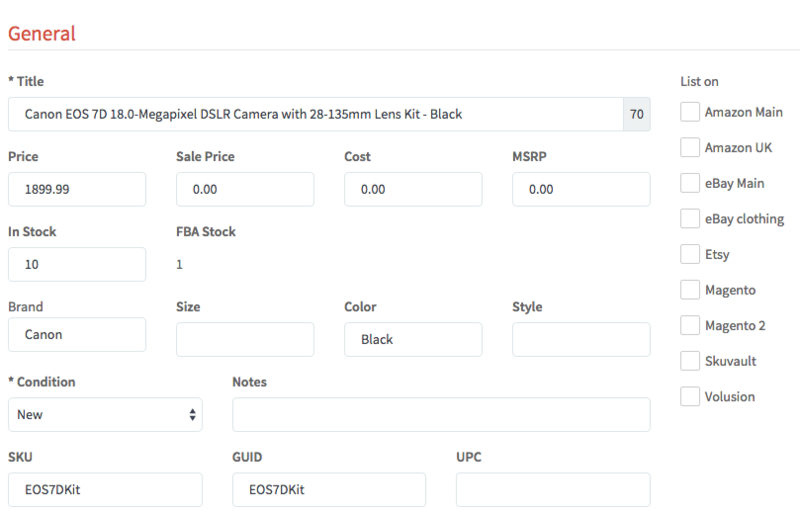 If your storefront template is built to include options such as Brand, Size, Color, Style, Condition Notes, you can fill those fields out too but they are only suggested. 3. 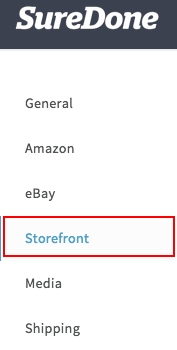 After you have filled out the General information, click the Storefront link in the left toolbar so you can easily jump down to the storefront section. 4. URI is what will be shown in the URL - example: http://domainname.com/the-title-of-your-product/ If you do not enter this, SureDone will automatically take the title you enter, add hyphens and lowercase the words. Category is the next selection. If you do not have Categories created yet, please follow this guide to be able to select a category or sub category. 5. Next is Name. If your template doesn't use this tag, it is unnecessary because your template most likely uses the Title. Description is used if your template is setup to use this field. Generally, your template may be sharing the longdescription field (Called Full Description in the General section). If you want to use the Description field instead, make sure this is changed in your template. Store State sets the availability status when your item runs out of stock. Stock will display the item as "out of stock" when stock=0. Active will display the item as active and available for purchase, even when the stock is 0. Store Rule sets the availability rule when your item runs out of stock. End will remove the webpage of out of stock items. Update will not end the webpage, but will defer to the "state" field to know what to do. Featured Product displays this item on the home page of your storefront. 6. Store HTML Title is where you define what shows in search engine results. By default, SureDone displays Title - Store Name If you want to show a shorter title or different information than the title, this is where you can change it. Store Meta Description is where you define the description of your product in search engine results. By default, SureDone does not enter anything in here. Additional Content is a field only used if your template uses the Content tag to display additional information. 7. Next, click the Media tab on the left. 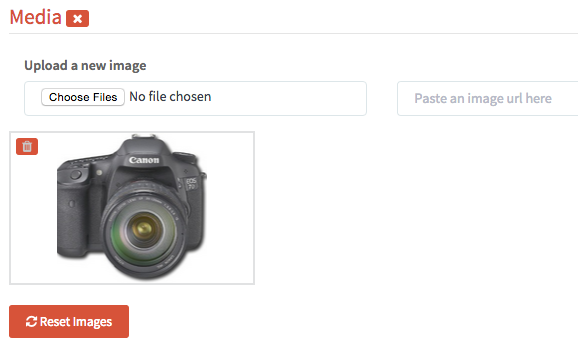 To upload images, click Choose Files and upload images. If you host your own images and they are not locally on your computer, you can enter the URL in the Paste an Image URL here section. SureDone will not download your images entered here, but will reference the images via this URL. ** If you would rather SureDone host the images, download the image and then upload with the Choose Files button. 8. Next, click the Shipping tab or scroll down to the shipping section. Enter the weight and dimensions here if you are offering Calculated shipping via your storefront. In order to offer Calculated shipping, you must setup USPS, UPS or FedEx so the calculation can happen with the carrier. Otherwise, you can set Flat Rate Amounts covered in the next section. 9. While in the Shipping section scroll past eBay and you will see the Storefront shipping section. You can enter a flat Shipping amount, add a Shipping Additional amount if you want to assign that for outside the lower 48 states, and then enter an International Shipping amount. You can choose not to ship internationally by going to Settings > Shipping. 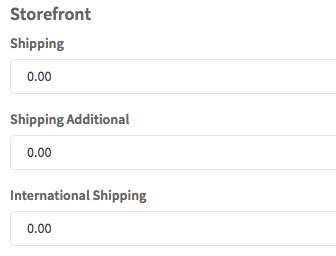 You will see International Shipping option about 6 options down. 10. Everything is setup for your storefront listing, you can either click Add or Retry depending if this is a new listing or existing listing.